Here they are! 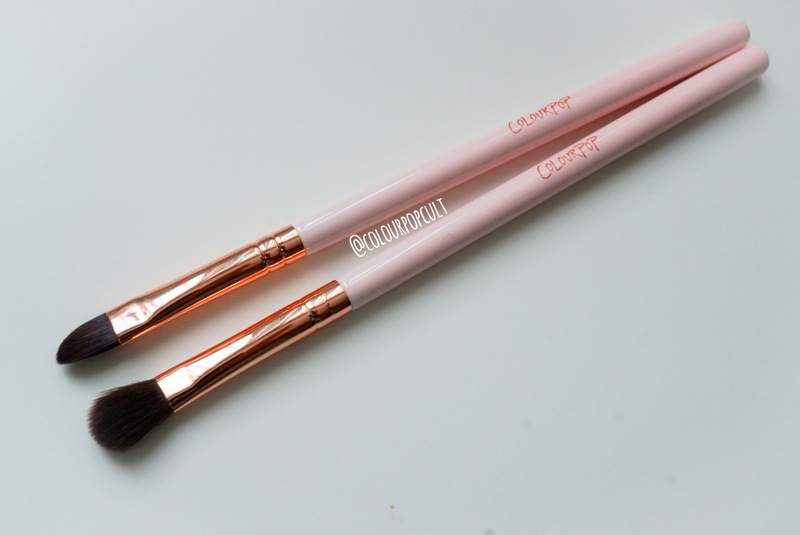 My freebie Colourpop Cosmetics shadow and blending brushes! These were free with purchase a few days ago and since I got mine I’ve been testing them with everything: not only #colourpop super shock shadows but with regular powder shadows, pressed pigments, loose pigments, loose shadows. :: and I love them. So this is a motion for @colourpopcosmetics to release them for sale cause I am in need of more. The flat brush works swell as a foiling brush: wet it for pressed and loose pigments and anything you want to foil and tap on your lid or swipe – it delivers. The fluffy blending brush does its job and it’s really soft along the way, it’s good for blending the crease, the lower lashline, blending inner corners, blending brow bone highlight, nose highlight.. but it’s small so you still need a bigger blending brush for overall blending of the lid.. hint hint ColourPop! The other day I did a live swatch with these and you saw how they performed– some SUPER SHOCK shadows you might still want to Use your finger for maximum pigmentation but the flat one gets pretty close to it! DID YOU GET THESE? How are you liking them!?!! What brushes do you think they should make next !? !